The likelihood of renewed armed conflict between Armenia and Azerbaijan over Nagorno-Karabakh may be diminished if progress can be achieved at an expected meeting between their foreign ministers on the margins of this year’s United Nations General Assembly. The principal task before these two officials is to organize talks later this year between Armenian President Serzh Sargsyan and Azerbaijani President Ilham Aliyev. Their efforts are backed by the United States, Russia, and France (the three OSCE Minsk Group co-chair countries charged with advancing peaceful settlement of this dispute). Such a summit could signal a step away from potential fighting and a return to the negotiating table. The political challenge here pits Armenian demands for ethnic self-determination against Azerbaijan’s sovereignty and territorial integrity. Even before the collapse of the Soviet Union gave Armenia and Azerbaijan independence in 1991, Nagorno-Karabakh—an autonomous region in Muslim-majority Azerbaijan populated mostly by Christian Armenians—broke away from central government control. 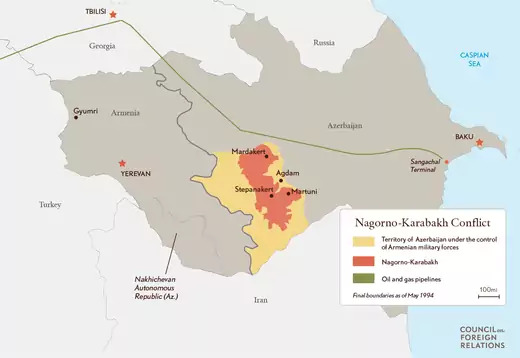 Hostilities here triggered intense warfare from 1992 to 1994, during which Nagorno-Karabakh forces, with support from Armenia, gained control over most of the autonomous region plus seven adjacent provinces, totaling roughly 20 percent of Azerbaijan’s geographic area. Some twenty to thirty thousand people were killed and more than a million displaced before Russia successfully brokered a cease-fire in 1994. For the past twenty-five years, the Organization for Security and Cooperation in Europe (OSCE) has been the principal international entity charged with advancing a peace settlement, primarily via the three Minsk Group co-chairs. While this group has largely managed the conflict and identified the central elements required for a settlement, little headway has been made on achieving a definitive peace agreement. This long-standing dispute in the South Caucasus—the region comprising Armenia, Azerbaijan, and Georgia—is complicated by an intricate web of actors and alliances. Russia is bound by treaty to defend Armenia and maintains a military base there, but sells substantial arms to both sides. Russia also serves, as noted above, as one of the three co-chairs of the OSCE Minsk Group. In addition, Armenia is a member of the Collective Security Treaty Organization (CSTO) under which an act of aggression against one member requires all other members to render support and military assistance. Turkey, a NATO member, has pledged to defend its ethnic brethren in Azerbaijan. Georgia, nominally neutral, receives substantial U.S. military financing and training assistance and engages in trilateral military exercises with Azerbaijan and Turkey (most recently in June near its capital, Tbilisi). 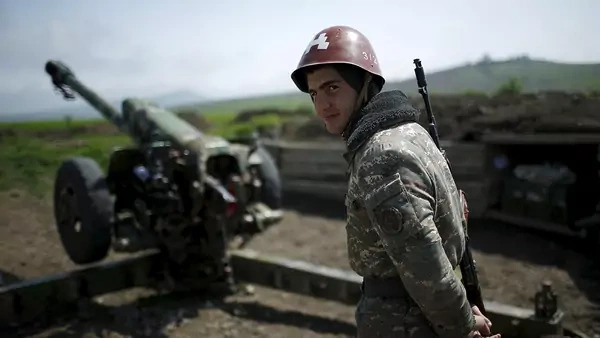 Tensions between Armenia and Azerbaijan over the contested region of Nagorno-Karabakh have remained alarmingly high following large-scale fighting in April 2016. Although the cease-fire established after that violence remains in place, mortar and small arms fire along the heavily fortified line of contact is a near-daily occurrence. Both sides have reported thousands of cease-fire violations in the past few months, keeping the potential for more widespread fighting high—whether deliberate or inadvertent. Leaders in Armenia and Azerbaijan claim they will not shy away from military action if provoked. The armaments now amassed in this region are formidable, with Azerbaijan’s military expenditures in recent years approaching $2 to $3 billion annually. Arms imports by Azerbaijan were twenty times higher than those of Armenia from 2012 to 2016, as Azerbaijan has acquired Israeli drones and air defense systems, Russian surface-to-air missiles, and other advanced weaponry. Armenia cannot begin to match its rival’s spending power, but has recently acquired additional heavy weapons and sophisticated missile systems from Russia, which it believes help maintain a rough military balance between the two. The ramifications of a significant clash over Nagorno-Karabakh would not be confined to the combatants or to the South Caucasus. Outflows of refugees may be generated that could seriously impact nearby Georgia, which counts substantial Armenian and Azerbaijani minorities among its populace. Georgia has also become highly dependent upon natural gas from Azerbaijan. Intense fighting could disrupt the region’s energy transportation network, which carries Azerbaijan’s resources across Georgia to Turkey and beyond. This network is now in the midst of a large expansion to help build European Union energy independence from Russia. For Washington, greater instability in the South Caucasus would further complicate already strained relations with Russia, Turkey, and Iran. An introduction of Russian troops to the conflict would also reverse long-standing U.S. efforts to deter Russian revanchism. Peace efforts to resolve the Nagorno-Karabakh dispute remain deadlocked. Since the violent April 2016 flare-up along the line of contact, political attitudes on both sides have hardened, offering scant potential for a compromise settlement. In response to the fighting, the Minsk Group co-chairs met with the conflicting parties and advocated confidence- and security-building measures intended to reduce the likelihood of violence. Two such measures—expanding the OSCE field mission by a few monitors and establishing an investigation mechanism for violent incidents—were accepted by the presidents of Armenia and Azerbaijan. These measures remain a top priority for negotiators, but more than a year after Russian President Vladimir Putin reconfirmed their acceptance, neither has been implemented. The Minsk Group co-chairs’ diplomatic focus in 2017 has centered on getting Sargsyan and Aliyev back to the bargaining table. Both France and Russia have expressed their preparedness to organize and host this session. On July 11, the three mediators huddled with the foreign ministers of Armenia and Azerbaijan in Brussels to encourage both presidents to meet later this year. Sargsyan remarked to the press on July 17 that he was prepared to participate in such a meeting, but that “expectations were not high.” He insisted that there would be no new approach from Armenia. Azerbaijan has made clear its view that further discussions must be substantive, with some genuine prospect of moving forward. Putin met in Sochi with Aliyev on July 21 and with Sargsyan on August 23, discussing bilateral relations as well as concerns about Nagorno-Karabakh. Still there was no public announcement confirming a possible Armenia-Azerbaijan presidential summit. Although such an encounter alone would not indicate progress toward resolving this long-standing conflict, it could augur high-level willingness to dampen the risk of renewed violence. The Minsk Group mediators are expected to rendezvous again should the foreign ministers meet in New York this month. There are some concerns about how high of a priority this conflict is for the Donald J. Trump administration. The interim U.S. Minsk Group co-chair, Ambassador Richard Hoagland, stepped down on August 28 and was immediately replaced by Andrew Schofer, most recently the chargé d’affaires at the U.S. mission to the UN offices in Vienna, Austria. Nevertheless, U.S. Secretary of State Rex Tillerson’s August letter to Senate Foreign Relations Committee Chairman Bob Corker has led to speculation that this special envoy position may be cut [PDF] as part of his pending reorganization of the State Department. Even if the position remains, Schofer may not be put forward for ambassadorial rank. This would place the U.S. mediator in a visibly inferior position to his Russian and French counterparts and could be interpreted as signaling waning U.S. interest in or support for the OSCE settlement process. OSCE and EU officials involved with the Nagorno-Karabakh dispute have voiced broad support for recent Minsk Group co-chair activities and the diplomatic measures—reestablishing a direct dialogue between the two presidents and advancing the already agreed confidence- and security-building measures—that are now in play. Civil society organizations and experts on the region, in contrast, have been more critical, underscoring the urgent need for greater action in light of an increasingly fragile peace. Humanitarian contingency planning. There is a need for UN agencies and nongovernmental organizations to carry out contingency planning to prepare for likely flows of refugees and internally displaced persons and humanitarian needs should large-scale conflict erupt. These issues have already been broached in Armenia, Azerbaijan, and Georgia. Such steps represent not only due diligence on the part of international actors, but serve to highlight to the conflicting parties growing international concern about bellicose action, as well as their potentially substantial human cost. Given the proximity of fighting in April 2016 along the Iranian border, it might be useful to consider similar discussions with Tehran. Military-to-military contacts. Outside states that may be drawn into a conflict in this region should be encouraged to develop specific military-to-military communications to mitigate prospects for unwarranted escalation. Such links have already proven valuable for Russia and Turkey in Syria. This could include periodic face-to-face encounters, as well as the establishment of communication hotlines. Restoring consistent communications links between the general staffs of Armenia and Azerbaijan would also be beneficial. Confidence- and security-building measures. The Minsk Group co-chairs should coordinate more broadly to pressure the parties to weigh additional measures that might reduce the risk of violence along the line of contact and the Armenian-Azerbaijani border. This could include each side meeting their commitments on notifying the other of planned military exercises made under the 1999 OSCE Vienna Document on the Negotiations on Confidence- and Security-Building Measures [PDF]. UN secretary-general envoy. To keep UN Secretary-General Antonio Guterres fully apprised of developments in this vital region and to underscore his personal concern regarding renewed warfare, thought should be given to the appointment of a UN special advisor focused specifically on Nagorno-Karabakh or the South Caucasus. UN specialized agencies will be called upon to perform essential tasks here if there is greater fighting (or, optimistically, should peace efforts advance). Elders group. There could be merit in exploring the contribution that might be made by a so-called elders group of well-respected public figures who could offer valuable counsel and perhaps provide technical mediation assistance. A more formal ink between the official OSCE negotiating process and the NGO community could also help with coordination activities. Technical dialogues. Bilateral dialogue should be facilitated between Armenian and Azerbaijani experts (and, where relevant, trilateral with Georgian experts) on broad technical issues ranging from water management and development of transportation infrastructure to ecosystem research and regional natural disaster response. Civil society. Finally, nongovernmental organizations should further expand efforts to foster contact between civil society groups that include youth, educators, businessmen, and journalists. There has been a steady ongoing effort in this direction, funded by the European Union, via the European Partnership for Nagorno-Karabakh. The September 8 Moscow dialogue, arranged by Patriarch Kirill with the religious leaders of Armenia and Azerbaijan, represents a step in this direction. It remains open whether the Armenian and Azerbaijani presidents will come together in 2017. Both men were present this week in New York, but did not meet. Instead, they spoke before the General Assembly and used their presentations to underscore their principal irreconcilable demands (self-determination vis-à-vis territorial integrity), to recount massacres and war crimes committed against their people, and to blame the opposite side for instigating the April 2016 clash. While each leader spoke briefly of a commitment to peaceful resolution of the conflict, their messages illuminated how distant that goal remains. In any case, this month’s gathering at Turtle Bay will have provided an excellent occasion for other diplomatic delegations—namely the Minsk Group and its co-chairs, the Organization of Islamic Cooperation, as well as Turkey and Iran —to meet on the margins and further explore how best to address the challenges posed by Nagorno-Karabakh. The General Assembly also presents an opportune moment for the new U.S. administration to reconfirm its commitment to performing a vital role in this peace process. If there is no near-term progress on the diplomatic front, many of the initiatives detailed above can and should be taken to highlight international concern, better prepare for renewed fighting, and to expand the space for progress on peace. Fortunately, some of these activities have already begun.